Welcome back to another lovely Paper Plate Twirler for Preschoolers. 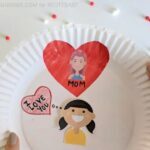 Our contributor shares with you today, how to make a gorgeous little LOVE BUG Paper Plate Twirler for Preschoolers. 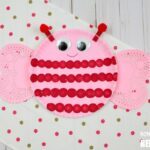 Not only do these Twirlers look adorable once decorating your classroom or child’s bedroom, but they are a great opportunity to strengthen fine motor skills (learn how to use that hole punch!) 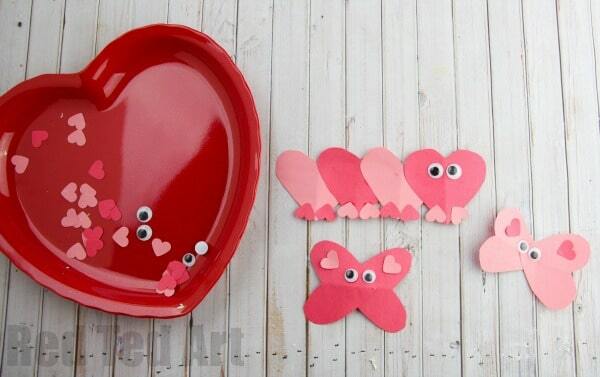 as well as explore shapes and how they go together (how creative can you get with your Love Bugs?). 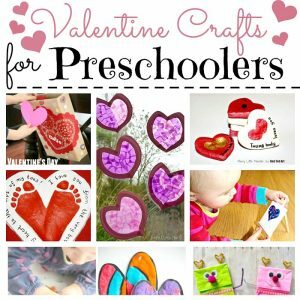 The results are adorable and perfect for any preschooler crafting this Valentine’s Day. 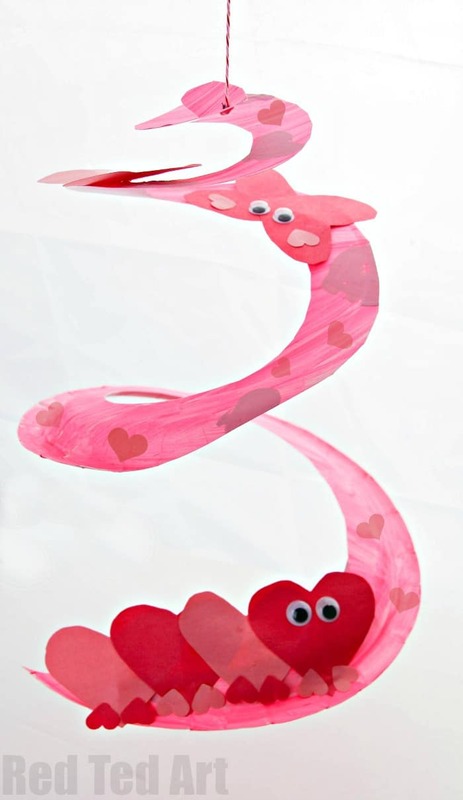 We think this Love Bug Paper Plate Twirler makes a fabulous addition to our Valentines Day Crafts for Preschoolers, don’t you?? 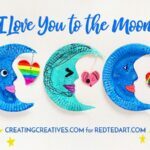 You may also love our Dragon Whirligig for Chinese New year, as well as our Night Star Paper Plate Whirligig (a great gift from a toddler to a newborn maybe?!). 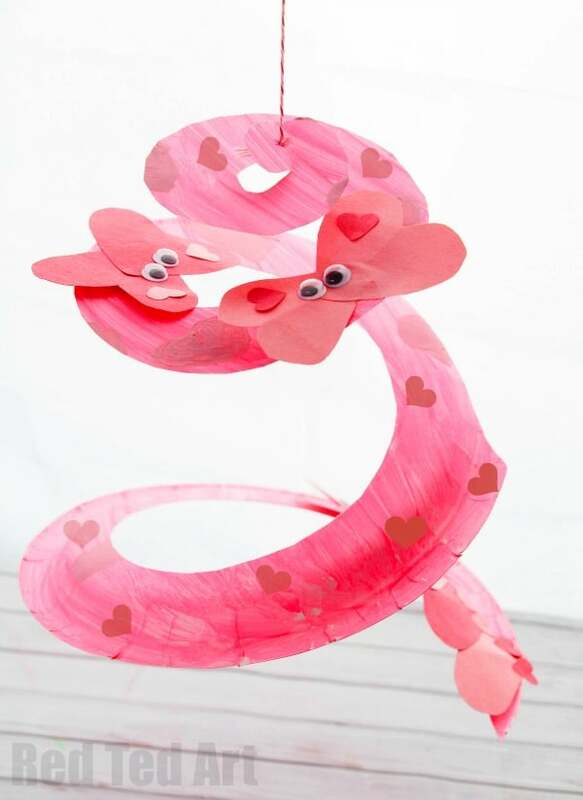 Love is swirly and dizzying – so what better craft for Valentine’s Day that a Twirly Swirly Valentine’s Whirligig?! 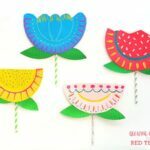 We are slowly building up quite the collection of these easy yet enchanting crafts in our sunroom – we simply tape them up on the ceiling and they add a bit of interest and movement to the room without adding clutter. 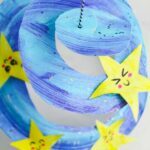 These whirligigs are easy enough for your youngest crafters to help make – they might just paint a paper plate and leave the cutting to you – while older crafters can add more detail, like the kawaii faces in our Star Whirligig, or writing sweet messages that you need to twirl the whole whirligig to reveal. 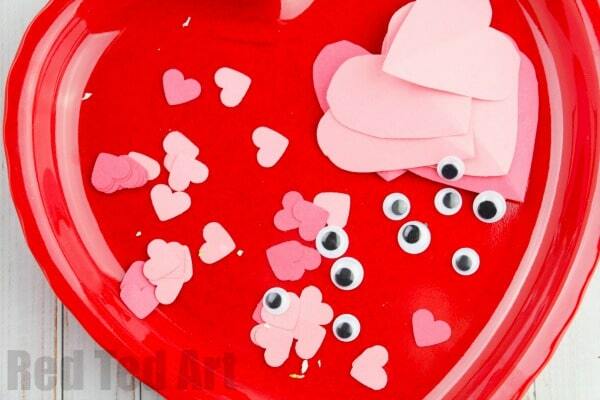 While we used a heart hole punch to help create some of the shapes for our love bugs, you can freehand some small hearts or use heart-shaped confetti for the same effect. 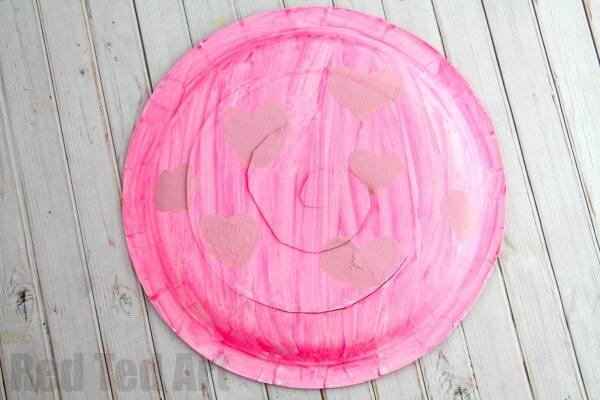 We used up the rest of our paper plates to make these Stained-Glass Paper Plate Tambourines. 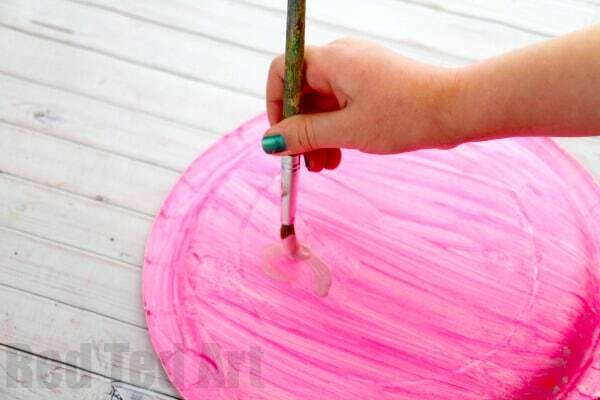 Paint the top and bottom of the paper plate with the pink paint however you’d like. We decided to add a heart pattern just for fun. 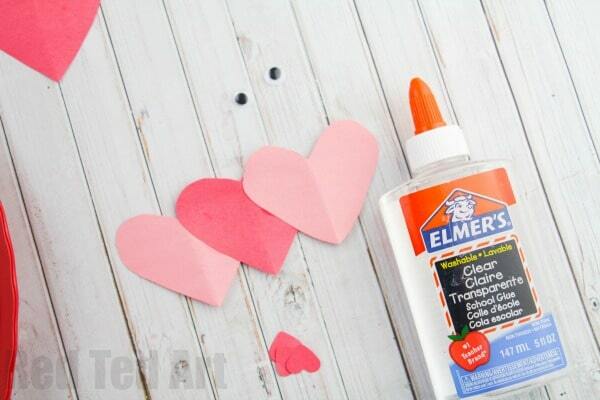 Let dry completely as you prepare the love bugs. 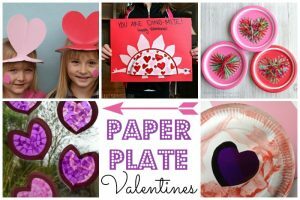 Cut out lots of hearts – cut some free hand as well as using a heart hole punch. 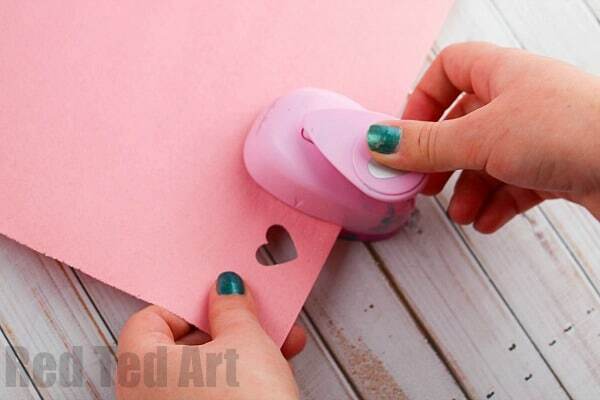 The heart hole punch is GREAT as a finger strengthening exercise for young kids. 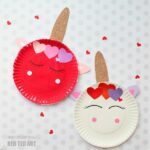 Now get creative and make a mixture of different LOVE BUGS!! 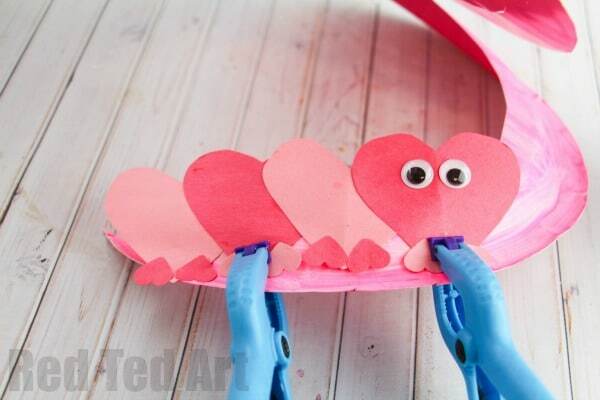 How can you combine your hearts to create you love bug creatures?! You can punch out additional heart confetti to add to the whirligig. 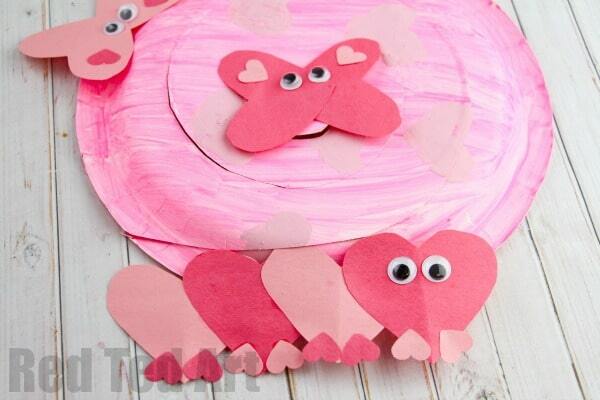 Glue the cute love bugs along the Whirligig. Let dry. 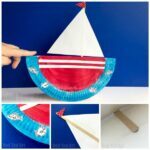 Poke a hole in the top of the spiral and thread the twine or string through and tie a knot.